The UK General Election gets every person in the United Kingdom and many abroad talking about who is going to be next leader of one of the original political powerhouses in the world. It is perhaps the biggest event for Britons, and one that holds great relevance and significance for them. Although most people are filled with uncertainty leading up to an election, there are some who are confident enough to put their money on the line in the hope of making a correct prediction and winning back more money than they had invested. These people are punters who have a special interest in UK political betting. For the political bettors, there is no bigger even than the UK General Election. To make a comparison, it’s like a sports bettor salivating at the prospect of winning huge bets at the FIFA World Cup. Betting on politics is nothing new for Britons. This has been going on for as long as parliament elections have graced the beautiful land of Britain. Back in the older days, betting on politics was not as widespread or explicit as it is today. Betting on politics was an action that was reserved for the elites in society, who had some degree of inside knowledge about the election mechanisms that and were better aware of the chances of a particular candidate winning the election. Today, any member of the general population in the United Kingdom can bet on a politician. Whether you are betting on a candidate to be the leader of a political party, or you are betting on an entire party to win the General Election, political betting in UK has come a long way. Since there is a huge demand for political betting in the United Kingdom, an easily accessible and highly visible market has developed to satisfy the needs and demands of these political punters in the United Kingdom. This is not a physical market, but rather one that is hosted on online platforms. All the renowned and internationally acclaimed betting websites in the United Kingdom that are usually used by sports bettors or gamblers are also known to offer political betting options. If you want to get involved in political betting, then you must focus on specific strategies to excel in this form of betting. As is the case with any other version of betting in the United Kingdom, the first step towards learning more about the bets that you are placing involves knowing the odds of what you are betting on. The odds are really important indicators that help you make up your mind on whether or not you are making the correct decision. If the odds are in favour of a particular part for the next General Election in the UK, then a sensible man would naturally pick the party with the greater odds. However, you always have the option of choosing a party that has the odds stacked against them. A party that has the odds stacked against them is not very likely to come out on top in the General Election, but if they do, then you can hope for some incredible prizes. If you are betting on someone or something that is not the favourites to win, then you stand a chance to win much bigger rewards. This is the simple case of high-risk and high-reward. Are you willing to risk your money for a bigger prize? Or do you want to stick to the mainstream option, go for the party that most people are betting on and hope dearly for the best? The choice is ultimately yours. Odds are huge factors in the success of your betting in more than one way. Although all the betting websites are focusing on the same General Election, each betting site has its own methodology of stacking the odds in favour or against a particular political party. 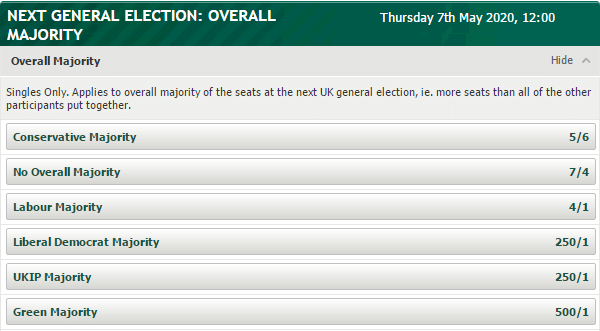 For example, the odds on the Labour Party at bet365 are not the same as the odds on the Labour Party at Ladbrokes. Each bookmaker comes up with odds that it feels is the best. Therefore, as a political punter, it is imperative that you select the online betting site as your betting platform, which has odds that will best serve your predictions. In order to this, you need to visit the individual websites and compare the General Election odds for every party. You could also visit websites such as www.politbet.co.uk, where you will be presented with the odds that various betting websites have placed on the different political parties that will be participating in the UK General Election. Comparing the UK General Election betting odds is what makes political betting actually enjoyable and exciting. The following is a set of odds on the political parties for the UK General Election 2020. Studying these odds will immensely help you to make an informed choice when making your final selection before placing the bet. By looking at these odds, most people will feel that sticking to the Conservative Party or the Labour Party is the wise decision. These two parties have a reputation of dominating the UK General Election, and hence the UK General Election Betting odds are usually inclined towards them. If you have to make a pick between the two, the experts suggest that selecting the Labour Party which is likely to be led by Jeremy Corbyn is the wiser bet.